A Moscow court has sentenced Russia's former Economy Minister Alexei Ulyukayev to eight years in a harsh-regime prison for bribery. He was also fined 130m roubles ($2.2m; £1.6m). He is the first minister to stand trial in Russia's recent history. Ulyukayev, 61, was arrested in 2016, accused of trying to extort $2m from state oil firm Rosneft to approve its purchase of another oil firm. He was accused by the Rosneft boss, who is close to President Vladimir Putin. Rosneft boss Igor Sechin was asked to testify but did not turn up. 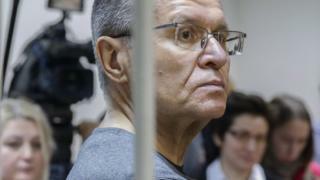 It was a security service sting operation involving Mr Sechin last November that put Mr Ulyukayev in the dock. Ulyukayev denied the charges and alleged he was framed. The verdict read out by the judge said Ulyukayev had "made use of his position in order to demand from Rosneft chief Sechin a bribe, in exchange for giving approval" for the purchase of state-owned Bashneft. "At the same time he told Sechin he would in future obstruct the company's activities if it rebuffed him," the verdict added. Oleg Feoktistov, a former secret service officer who worked for Mr Sechin, testified that the bribery had taken place on the sidelines of a Brics forum in Goa, India. Brazil, Russia, India, China and South Africa form the Brics group. "Using two fingers he indicated the sum he wanted to receive, which was equivalent to two million dollars," Mr Feoktistov said, citing what Mr Sechin had told him. With the Kremlin surrounded by a wall of secrecy, conflicts in the corridors of Russian power are often hidden from sight. The Ulyukayev trial has given a rare insight into political infighting in Moscow - into clashes between Kremlin clans. Ulyukayev was seen as an economic liberal; the man he claims framed him - Igor Sechin - is viewed as a hawk, a Putin ally who backs greater state control over the economy. Ulyukayev's conviction and imprisonment looks like a victory for Kremlin hardliners. It reinforces Mr Sechin's reputation as the second most powerful man in Russia after the president. But it risks causing an embarrassing split at the heart of Russian power. Ulyukayev was influential but not part of President Putin's inner circle. Mr Sechin's close ties to Mr Putin go back to the Soviet 1980s, when Mr Putin was a KGB officer. On Thursday Mr Putin shrugged off Mr Sechin's failure to testify in court. The president said the court had enough materials for the case, including information that Mr Sechin had provided. The case has highlighted rivalries at the apex of Russian politics, BBC Russian reports. Mr Sechin's version of events prevailed and inconsistencies have emerged in the case against Ulyukayev, BBC Russian reporter Sergei Goryashko says. Ulyukayev insisted he was innocent, saying he had no idea a bag given to him by Mr Sechin contained money. He said he thought it was expensive wine which, allegedly, Mr Sechin often presents to business partners along with speciality sausages, as gifts. According to former Kremlin public relations manager Gleb Pavlovsky, the case showed that "anyone with money can put anybody in jail" in today's Russia.